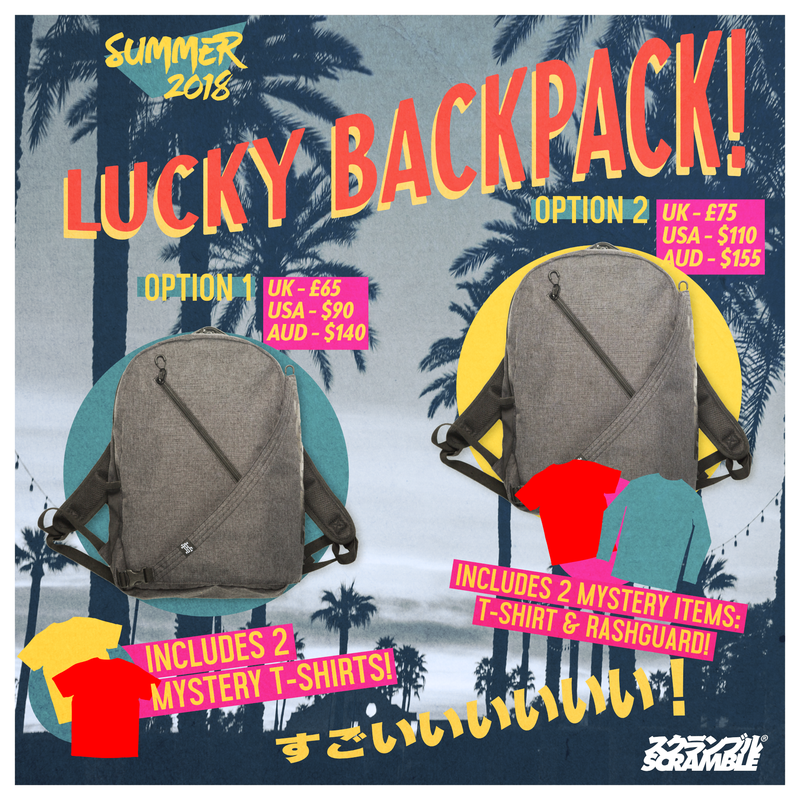 Scramble Lucky Backpack – Tee and Rash Combo-Breaker! We will be holding a “Lucky Backpack” Sale event from Friday 28 June, finishing at the end of the day on Sunday 1st July. Our New Years Day Lucky Bag Fukubukuros are immensely popular, and that event will still be happening on January 1st. We’ve done a similar thing with this Lucky Backpack event. There are two options, with the first, you will receive a backpack with two free mystery BJJ t-shirts inside. We might even throw in some patches and stickers, too. Apart from getting a great deal (the total value will be much higher than what you pay), you will have the excitement of not knowing what you will receive. You might get something you would not ordinarily have bought, and find that you really like it. Or you might receive something you already have, and you then have a backup for when ninjas attack and your favourite jiu jitsu shirt gets ripped. Or you can give it to your favourite jiu jitsu friend – because to give something away is truly better to receive it, or something like that. I guess. Check the store on Friday!